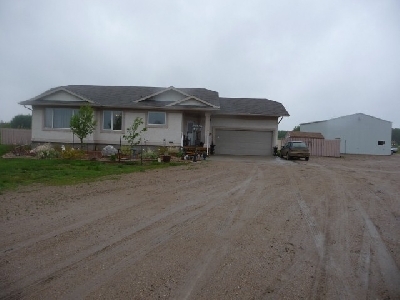 This acreage is a horse lover’s dream that offers both privacy and location, surrounded by natural bush and located within 15 minutes from Regina. This home is located on a 150 Acres very private with natural bush and rolling hills just minutes from Regina east end on Hwy 1 or Hwy 46. Land is fenced and cross fenced with approx 40 acres of pasture with sloughs and natural bush and approx 100 acres that is newly seeded approx 3 years ago with broom alfalfa. Pasture has new coral systems and water with a heated watering bowl, 60 amp breaker panel at the pasture has been placed for future barn. Exterior has a new 2009 built 30x40 shop with complete electrical 100 amp service and cement floor with in-floor heating pipe installed. Yard includes 3 wooden bins and 1 steel round 3200 bushel bin. Large back yard is fenced and includes an 8x10 wood barn garden shed and garden area. This beautiful bungalow consists of stucco exterior, front covered deck with large pillar and PVC white railing. This home features 1230 sq ft of living space, 4 bedrooms and 2 bathrooms. With a front covered deck, the front entrance has a large grand foyer with vaulted ceiling that lead into an open kitchen and dining area. The kitchen has maple cabinets with a large working island-eating bar, stainless steel appliances and dishwasher with an owned Culligan reverse osmosis water system. Flooring throughout the kitchen, living, dining and foyer is centennial walnut laminate. The master bedroom has double closets and a full ensuite with a corner jet tub. The main floor laundry off the foyer includes appliances and leads to the double attached insulated and dry walled garage. Partially finished basement with maple railing includes two large bedrooms and in-floor heating. · Partial finished basement includes two large bedrooms with white bi-fold doors.